It’s never been a conscious effort to replicate the junk piles of my ancestors, but even when I was young, I was fascinated by the grandparents who surrounded themselves with interesting stuff. Grandpa Wargo’s house was a packed menagerie of wonderment, made even more special by the fact that everything was at least 30 years old and in like new condition. It was very neatly kept, but there was a lot of it, and much of it very exotic to my eyes. It was also the smell, which was something akin to, but not quite, anise-like. When we’d visit, he’d make me sit on the newspapers that he would pile up on the springy couch so that I could “flatten them out.” My dad and I painted his front railing once, and the can of black paint he procured from the basement looked like something he smuggled out of his job at Pratt & Letchworth in the 1930s. 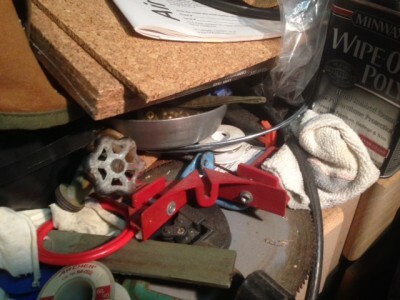 For as tidy, new, and organized as Grandpa Wargo’s stuff felt, Grandpa Coyle’s was just as messy, piled, and chaotic. The 1880’s basement on Hayden Street was filled with old dishwashers, a ringer wash machine, my uncles’ old sporting equipment, and hundreds of scraps of wood, door knobs, bits of glass plate, and rusty tools. It really would have been a childhood paradise were it not for the healthy dose of fear created by the medieval looking rat traps hiding around most corners. The moment you walked into Grandma Cichon’s front door, there was an overloaded, wall-to-ceiling bookshelf. It was in the little foyer between the screen door and the heavy door in the Seneca Street Victorian– in the place where most people might put coat hooks. It was an eclectic haphazard collection– one of many eclectic haphazard collections spewn throughout the old South Buffalo house. Our coats would go on the carved oak newel post. Even though I admired the gargantuan clutter clatches of my grandparents, I fostered no plan to replicate them. Yet here I am. Having lived in our own big old house for 15 years, I’ve collected enough rubble and detritus to make the junk-accumulating pioneers in my life proud. I don’t think the pride would come from the stuff, though– it’s the type of thinking the stuff represents. How am I supposed to fix something when it breaks, if I don’t have a basement crushed to the gills with useless bric-a-brac which could one day be the missing piece in making sure the door knob stops falling off the front door? I’m sure people do it– fix without junk– but I learned how to fix stuff by watching Grandpa Wargo and Grandpa Coyle. Step one was always go stare at your junk for a while, and hope a solution jumps out at you. A small portion of my basement work bench. 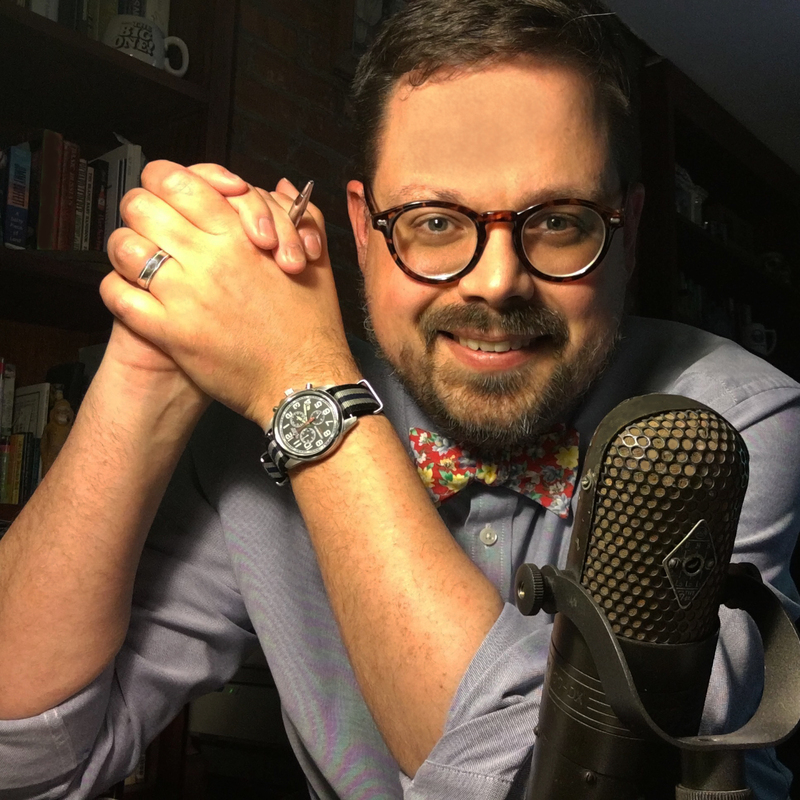 I would love a clean, sanitized basement without frankly embarrassing piles of mad-scientist/Rube-Goldberg-looking junk everywhere… But I’m afraid– and it’s a real fear– that I’ll lose some part of who I am without the stuff. How do I move onto step two in the repair process without step one? I’ve been thinking about how to fix the door knob for weeks, and the answer is not in the basement junk. Both grandpas would be happy with my solution, I think… It’s going to start with the same long stare– not in the cellar, but on the “nut and bolt” aisle at Home Depot. What started me writing today, though, is my books. I’ve always had books and always had a bookshelf. For as long as I can remember. When we bought our house, I built and stained immense wooden bookshelves on both sides of the exposed brick of the chimney in our office. I loved idea of being surrounded by books, and that one day I’d have those shelves filled. Of course, now it looks like a ladies guild buck-a-bag sale in there. Books are piled on the floor and on the desk and, in a trick I learned in Grandma Cichon’s front hall, sideways on top of books properly upright on the shelves. Most of the books I buy these days are Buffalo and Western New York histories and reference volumes. These are all keepers– Both old and new– all filled with information you can’t find online. Online. There’s the rub. The first quarter-century of my book collecting came before the Internet and the e-Book. I have half a shelf of really great dictionaries, thesauruses (thesauri? ), and wonderful language resource and reference books which have gone untouched for at least a decade. Wonderful history texts, too. Spine literally not exercised in ten years. There are also the paperbacks which for decades I so vigorously foraged. Classics, interesting old biographies, best sellers of decades’ past– anything that might make for a good vacation or rainy weekend read down the line. 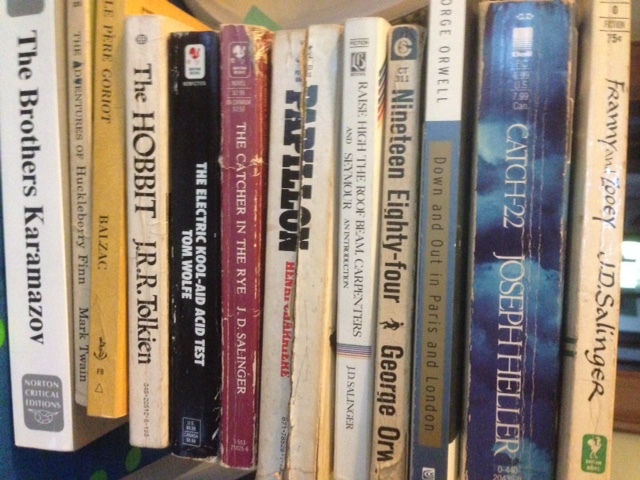 Most are now dust-covered and more forlorn-looking than when I plucked them from a yard sale or library fundraising pile. A gift from Grandma to Dad… the inside cover of a hardcover bound collection of Superman comic books. The most complicated group of books are the ones that mean something to me. Not the stories; the actual books. Some are transplanted from that mythical shelf at Grandma’s… Some even have her writing in them. 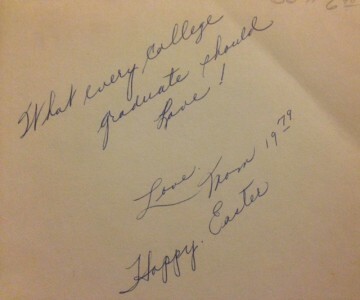 Plenty were Dad’s, annotated in his very heavy handed, unintelligible scrawl. With still others, holding the book takes me to the place where I read it. Physically, mentally, emotionally. The problem with all these books are they are as much bricks as books. They are of little tangible use to me, and they actually take space away from my Buffalo book collection which I use quite vigorously and enthusiastically. I know I won’t be using them as books– well, only insofar as anyone uses books as window dressing to look learned when their bookshelves are examined. I’m not exactly happy with myself over this, but I’ve completely forsaken the smelly paperbacks with degrading paper for the tablet. A piece of me has died just writing that sentence, but it’s true. And there isn’t likely any going back. And while I have warm memories of dictionaries and thesauruses (thesauri?) in every room of my house, for better or worse, the World Wide Web is really a remarkable resource in these areas. I’m not sure what Grandma Cichon would have thought of this, but it’s the cold truth. I sat down to write this tonight as I was having an existential crisis while trying to cull out the jetsam and flotsam of book collection. I don’t want to be someone without great books, but I don’t want to be a phony, either. There will certainly be room for the Buffalo books and most of the meaningful ones, too– although I may have to find a less reflective day to decide where that meaningful line is drawn. Each of these silly paperbacks are a tangible reminder of many things– including that I probably need some sort of therapy. Maybe a box or two might make it to the attic for further reflection, but those smelly paperbacks (which believe me, I still love!) will likely be boxed up and shipped out for their next rescue. I’ll drop them off with the same hope that people have when they drop off dogs and cats at a shelter, but the reality will probably be the same. I hope my paperbacks– some of which have made 4 or 5 moves with me– will find a good home on a good bookshelf somewhere. Maybe they’ll even be read on the MetroRail on the way home from work… or maybe they’ll be read as the big raindrops hit the window and the smell of percolated coffee wafts through the air inside the slightly muggy-but-now-cooling-off state park cabin. But we know the truth. Anyone who wants to read Huckleberry Finn can either download it– or at least find a copy where the pages don’t disintegrate and break from the binding with each advance in the book. I always loved that struggle, and felt somehow more high-brow in the low-brow of it all. Now I feel high-brow when I read great novels on my phone instead of cruising on Facebook. It’s not better or worse. It’s the same and it’s different. It’s a soul crushing crisis. 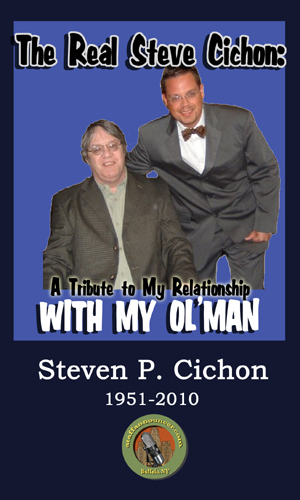 My ol’man, Steven P. Cichon, died Palm Sunday, 2010 at the age of 58. Losing a parent is unimaginable, even when you spend the decade up until the death imagining it over and over again. For the last eight years of his life, my dad was a very sick man. He lost a leg to diabetes and had a very serious heart condition. He made regular trips to the hospital by ambulance, and then spent weeks at a time in the hospital. Often. During those times when he was very sick, I tried to prepare myself for his death. Tried to think it through; imagine what it might be like, so it would all be easier to deal with. No dice. Many of us know that it’s all unimaginable. An extension of yourself is gone. There’s a hole in your heart. All sorts of vital information is gone. It’s like somebody lit the reference book you’ve used your whole life on fire. You’ll read, too, about quite a few things I’d do just for dad, that I sadly have stopped doing. He’s been gone about two months as I write this, and it’s still incredibly hard. I have no doubt that it always will be. But putting all the swirling emotions I’ve felt into writing this has been wonderful. It’s the story of my dad’s last week on this planet, the story of his life on this planet, and, mostly, the 32 years he spent on this planet as my Dad, and Dad to Greg and Lynne. Purchase book: 46 photos, 56 pages. Paperback.